Elevator Bank in the World Trade Center on the floor of the Secretary of the Port Authority. 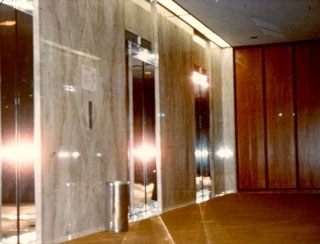 Elevators in the World Trade Center, July 1977. 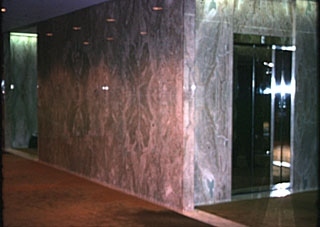 Secretary of the Port Authority's office in World Trade Center, 1977. Note the art on the wall. The World Trade Center was controversial from the beginning. Originally proposed for a site on the East River at the foot of Wall Street, it was supposed to contain one 50 to 70 story tall building, a trade mart and exhibition center, and a securities exchange building. How the project came to move to the West Side, to be built by the Port Authority of New York and New Jersey, a bi-state agency created by Congress with the power to issue tax exempt bonds and to condemn private property, is one of political chicanery, gross illegality, presidential ambition, and criminal incompetence. The World Trade Center was first proposed in 1960 and construction started in 1968. These were the years of America's overweening arrogance, the years during which the Vietnam War was pursued with overwhelming popular support. These were the years when Nelson A. Rockefeller, the Governor of New York, was promoting the construction of huge projects all over the state. Nelson Rockefeller's motto was: "Small buildings breed mean vision." The United Nation building mid-town on the East Side was built on land donated by the Rockefeller family. Then there's Rockefeller Center. Nelson was a big promoter of Lincoln Center for the Performing Arts. Rockefeller promoted the Mall in Albany, New York, the state's capital. And his piece de resistance was the World Trade Center. The World Trade Center, even before the September 11 bombing which killed over 3,000 people and sent New York City's and the world economy into a tailspin, had already been responsible for the bankruptcy of New York City's government in the 1970's. It is ironic that Gerald Ford, the President during New York's bankruptcy who refused to help it out, spawned the political careers of many of the people in the Bush Administration who, having stolen the election, are now faced with cleaning up the resulting disaster. The Port Authority of New York and New Jersey was created in 1921 to rationalize the rail, ship and terminal operations in the Port of New York, which is divided between New York on one side, and New Jersey on the other. According to the legislation, the Port Authority "shall constitute a body, both corporate and politic, with full power and authority to purchase, construct, lease and/or operate any terminal or transportation facility" within the Port District. By 1960, the Port Authority operated bridges and tunnels, airports and port facilities, and warehouses. At about the same time that the World Trade Center was being proposed for a site on the East River, the Hudson and Manhattan Railroad, a small line which ran from Newark to lower Manhattan through a tunnel under the river, was going bankrupt. It needed a lot of investment in infrastructure and the commuters who used the line to get to work in lower Manhattan did not want to pay higher fares. With millions of dollars in excess revenues pouring into the Port Authority from the tolls on the bridges and tunnels, some people though it would be a good idea for the Port Authority to buy the bankrupt Hudson and Manhattan Railroad properties, put up the money for modernization, and run the improved line. After all, it was the Port Authority's bridges and tunnels that enabled commuters to abandon the railroad and drive into the city. New York Governor Nelson A. Rockefeller, then in his first term, insisted that the acquisition of the Hudson and Manhattan Railroad be linked with construction of the World Trade Center. The Port Authority is a bi-state agency. From Rockefeller's perspective, the takeover of the Hudson and Manhattan Railroad would primarily benefit New Jersey commuters. He felt that the World Trade Center would be a benefit to New York (he was wrong), so that linking the two projects was only fair. The Port Authority did buy the bankrupt railroad. It paid the price it wanted because it threatened to condemn the property if the railroad did not accept its offer. The railroad consisted of right of way, rolling stock, the tunnel under the Hudson River, and some office buildings at the terminal end in Manhattan. Once the deal was done in 1961, the Governor-elect of New Jersey, Richard Hughes, insisted that the World Trade Center's East River site would not benefit residents of New Jersey. Hughes insisted, and the Port Authority agreed, to move the Trade Center to the West Side and to build it on the site of the newly acquired Hudson and Manhattan properties. The Port Authority then decided, once the Hudson and Manhattan Railroad had been acquired, to move the World Trade Center site to the West Side site and to build the Twin Towers, a much bigger project than the original proposal. The only problem was that the tenants on the site did not want to move. The area around the Hudson and Manhattan terminal was known as "radio row" the electronics supply industry of New York. At a time when the piers were becoming obsolete as break bulk shipping was replaced by containerization, the Port Authority of New York tore down the electronics industry to build an office building which never made money. The Port Authority destroyed the biggest manufacturing growth industry of the late 20th century to build an office building which was a monument to the economic base of the city in the 19th century. Opponents of the World Trade Center, mostly displaced businessmen, but also others, fought against the World Trade Center all the way to the United States Supreme Court, twice. Even after the project was approved, activists, called the Committee for a Reasonable World Trade Center, tried to get the project scaled back, but to no avail. Never before had such grandiosity and luxury been funded with tax exempt bonds. The office of the Secretary of the Port Authority was huge, with a panoramic view of New York Harbor. 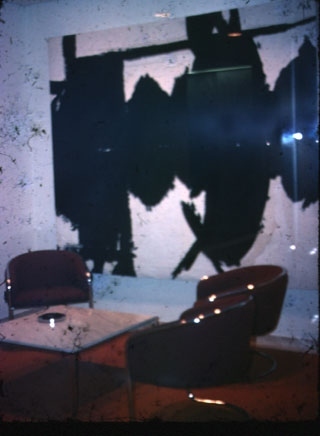 The pictures of the Secretary of the Port Authority's offices in the World Trade Center included in this article were taken in July, 1977 by the author. He only went into the twin towers twice in his life. July 1977 was the last time, just to take these pictures. Many, many people refused to work in those buildings. The World Trade Center was designed by architect Minoru Yamasaki. It was not the only one of his buildings to be destroyed. On July 15, 1972, the massive Pruitt-Igloe public housing project in St. Louis, Missouri was imploded by demolition experts. Destroyed at just 17 years old, the Pruitt-Igloe houses were called by the mayor, "a complete and colossal failure." Unfortunately, the World Trade Center had already been built by the time Yamasaki's incompetence was discovered. Here is the description of Pruitt-Igoe in DIVIDED WE STAND, a brilliant biography of the World Trade Center from a city planning perspective written by Eric Darton. "Of course, the implosion of Pruitt-Igloe has made Newman's allegations untestable, [this was written before the second attack destroyed the World Trade Center proving the point] but you need only stand for a moment in Austin Tobin Plaza to become immediately and keenly aware of how Yamasaki's abstract sculptural ethos achieved a kind of chilling perfection in his World Trade Center design. Here you find yourself in the presence of two monumental structures whose formal relaitonship gives no indication of their purpose or intent. [Which is to be big and conspicuous. ]You know they are office buildings, yet their design makes it nearly impossible to imagine that they are full of people. It is at this point that you realize the trade towers disappear as sites of human habitation and reassert their power at the level of an aesthetic relationship. And it is through recognizing this process that you may become uncomfortably aware of a kindred spirit linking the apparently polar realms of skyscraper terrorist and skyscraper builder."